How many hours a week do Chinese doctors work? Too many. After featuring many articles from the Lancet's China-themed issue it is only right that I give some attention to an article published by their competitor, the BMJ. This week a blog post from four Chinese doctors lamenting the long hours they have to work. According to the lead author, Dr Luo Deng (an endocrinologist at the Shanghai Jiao Tong University Affiliated Sixth People’s Hospital) China's doctors work an average of 11 hours a day, six days a week. That's an average - not the maximum. And before you jump in and say that many doctors in other countries work those long hours - remember that Chinese doctors earn about $5000 a year. The working hours figure comes from a survey of more than 3771 Chinese doctors, which found that 80.5% worked more than eight hours in hospital every day. The exact figures were an average of 11.22 hours per day for 5.62 days a week, with only one day off. "On top of this, we fear that the increasing number of daily hospital outpatient visits, along with administrative or academic affairs, may further contribute to the imbalance between family and career in doctors’ lives," the doctors write. The doctors blame the heavy workload on a huge increase in patient consultations in the last decade - up from from 1.21 billion in 2001 to 2.74 billion in 2013. During that time, hospital admissions increased nearly fourfold, but the Chinese government still spends only about 5% of its GDP on health, compared to 8.8% for Brazil and 9.2% for South Africa. "With a generally high patient to physician ratio in most practices, and near constant patient contact throughout the workday, most physicians find it difficult to take even a short break. 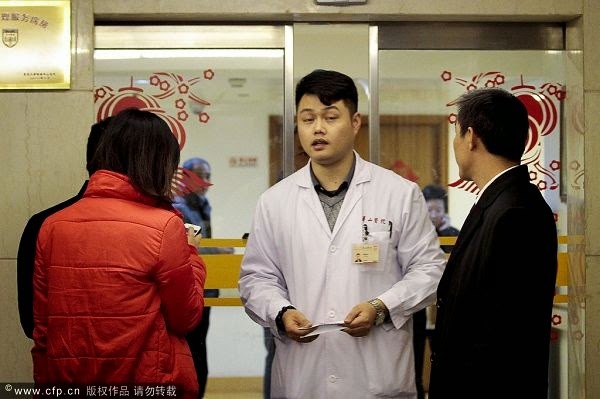 Even the public of China has begun to raise concerns about the physical and mental health of physicians; however, these issues probably remain unknown to much of the world," the Chinese doctors write. They suggest, quite meekly, that the government implement "effective and efficient measures ... to improve the health of China’s medical staff, and boost their career enthusiasm amid the stressful job atmosphere." After God the life of the patient is in the hands of the doctors. So doctors should work hard for the patients. The Chinese doctors working 5.62 days a week that is truly appreciable but you can check bestessays review to manage your thesis work. Such rules and regulations to make the hospitals effective should implement in all the countries.